IONIC Edge Chassis racers Alex Vrabel and Elijah Skaggs continued their busy 2016 racing season with a July 1-3 stop at the popular Michiana Raceway Park in South Bend, Indiana, where the AKRA American Sprint Cup Northern Tour was holding their second round. 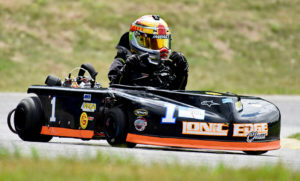 Alex Vrabel, who notched a couple of wins in the AKRA Northern Tour opener at Genesee Valley Kart Club in Avon, NY, in early June, continued his winning ways at MRP with four feature victories between Saturday and Sunday’s 206 Junior and Pro Gas Animal Junior main events. Fighting off spirited challenges from Ohio’s Alex Sullivan, Vrabel drove smart and hit his marks in a mistake-free weekend to earn the four wins aboard his brand-new No. 6 IONIC Edge Chassis. The weekend prior to MRP the Vrabel team was in South Carolina for the second round of the WKA Gold Cup Series, where Alex drove his IONIC Edge to a pair of 3rd-place finishes in the Junior Pro Gas Heavy main events. In just a month’s time the Vrabels’ raced in New York, South Carolina and Indiana between two different series with Alex winning six features and never finishing outside the top 5! Great job Alex, Jon and family! Elijah Skaggs and his dad, Joseph, became the first drivers to qualify for the AKRA Grand National Championship event this October at Jacksonville with their attendance at MRP last weekend. Traveling from their Tennessee home, the Skaggs decided to continue their AKRA season in the Northern Tour at MRP after proving to be one of the series’ top racing families in the Southern Tour at Carolina Motorsports Park in March and Barnesville in April. After finishing P2 in three of the first four 206 Cadet features in the Southern Tour and sitting 2nd in the point standings, Elijah drove his IONIC Edge to his first feature win of 2016 at MRP in Saturday’s 206 Cadet final. Congratulations to Alex and Elijah on some great driving and making us proud at Luttrell Racing! A number of IONIC Edge Chassis are in action in the Briggs 206 Cup Series in the Midwest. On June 11-12 the series was at Badger Raceway in Dousman, Wis., where Kyle Clasen, Dan Roche, Randy Westlie, Nick Ksobiech, Leanna Ostrowski ,Will Holtz and Briggs & Stratton’s David Klaus all drove IONIC Edge chassis to success. Klaus impressed in the Masters 390# class, finishing P3 Saturday and P2 Sunday and a 2nd and 3rd in qualifying, respectively. Clasen was just behind in qualifying with nice runs for P4 and P3. Kyle finished 6th and 7th in each day’s Masters final. Westlie and Ksobiech ran up front in Junior 310# all weekend with finishes of 2nd for Westle and 3rd for Ksobiech each day. Will Holtz ran 3rd in Saturday’s Sportsman 265# and qualified P3 both days. Dan Roche raced the Senior Medium 350# category and finished P8 Saturday and P6 Sunday of 13 entrants. And Leanna Ostrowski has been racing her IONIC Edge at Badger in the Animal Senior class and doing well with a number of top-five finishes thus far this summer. Here’s what’s on IONIC Edge Chassis racers schedules for the remainder of the summer. If you’re interested in our chassis, programs and support, visit IONICEdgeChassis.com or contact Kyle Luttrell today at 404-516-8934 or kyle@luttrellracing.com. 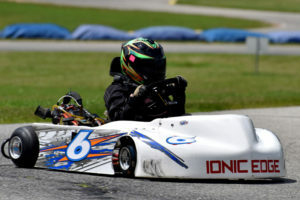 Ionic Edge Chassis is a go-kart chassis manufacturer based in White, Georgia. Owned by Kyle Luttrell, Ionic Edge builds chassis for sprint, road racing and oval-track applications.